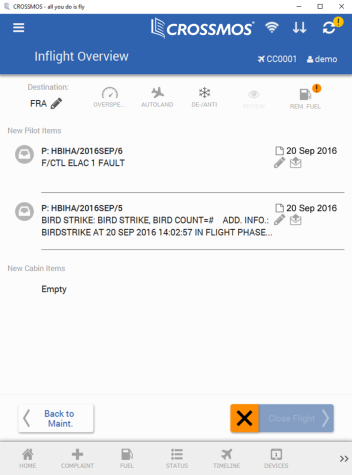 Inflight Overview: All the information the pilot needs during the flight including the complaints entered by the cabin and cockpit crew. 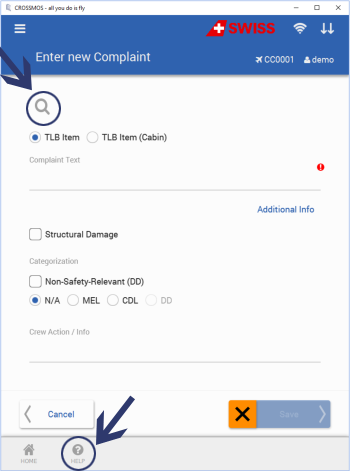 Guided Cabin Complaint Entry: Use image-based decision trees to find a suitable complaint template. Maintenance Client: Perform all the work necessary, including entering actions, deferrals, closure and CRS data. New users are guided by tooltips and online help. CROSSMOS ELB will let you drop the paper in no time. 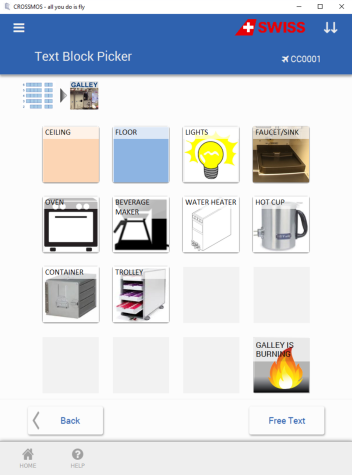 On every screen there is a questionmark-button which leads you to the user manual. 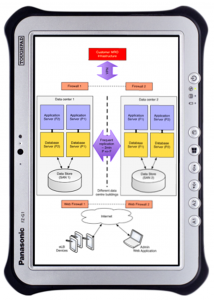 The CROSSMOS ELB is an integral part of going paperless. It can run on the same hardware platform as other software in the cockpit. 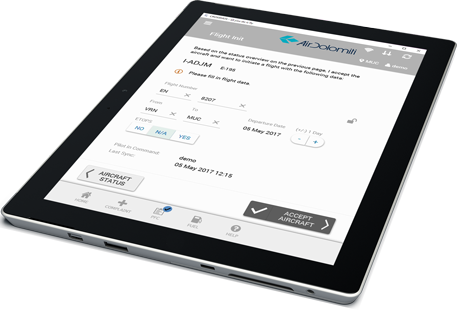 It integrates with the electronic Flight Bag and an electronic MEL. 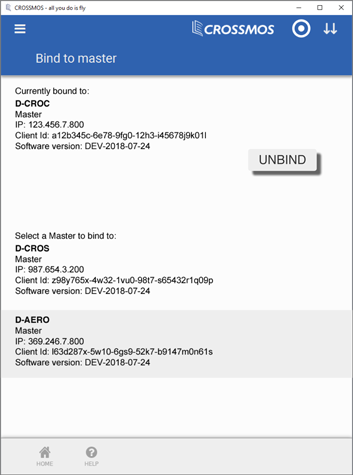 Having installed CROSSMOS® on their personal devices, maintenance and cabin crew can get access to every aircraft that is within the signal range of the WiFi connectivity of the devices. 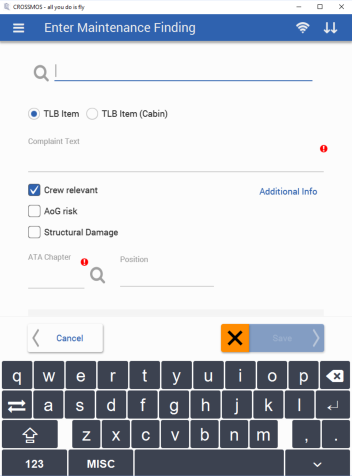 Maintenance can now connect their devices to the master device of the aircraft which they are working on. After having finished the maintenance on that aircraft they can go to the next AC and start working on this one. Maintenance crew gets a list of AC that are available and can login to any of them. 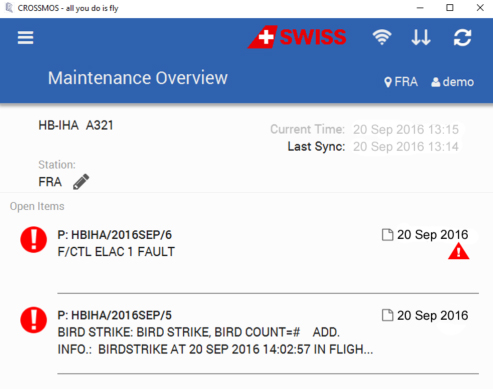 It is also ensured that the software version on the maintenance device is always the same as on the master device (which must be aircraft bound) so that data can be synchronized easily between the two devices, the ground server and the MRO backend system. No need for long-term paper storage. The digital original is backed-up and kept for years as part of our SaaS deal. All data on board is collected by a Master Device. Data is stored in two locations. Files use strong encryption to be safe from prying eyes and modification. All data communication is encrypted.